India's Missile Defenses Can Now Take On Decoys. That's a Really Big Deal. India’s efforts to build a homegrown ballistic missile defense system achieved a major success. On August 2nd, India tested its Advanced Area Defence (AAD)/Ashvin Advanced Defense interceptor missile against decoy targets for the first time. “One target among simultaneously incoming multiple targets was selected on [sic] real time, the weapon system radars tracked the target and the missile locked on to it and intercepted the target with a high degree of accuracy,” India’s government announced in a press release . The test was against a medium-range ballistic missile with a range of 1,500 kilometers. Franz-Stefan Gady of The Diplomat speculates that this was the first test of the new indigenous imaging infrared (IIR) seeker, which was developed to help the interceptors distinguish warheads from decoy/dummies. China-India 'Cooperative Competition' In Iran Beijing needs Tehran for its Belt and Road Initiative, whereas New Delhi needs Tehran for its International North-South Transportation Corridor. KABUL - Afghan troops and Taliban fighters clashed across an eastern Afghan city on Saturday, as each side claimed the upper hand in the latest major confrontation in the 17-year war between U.S.-backed government forces and the country’s largest, most powerful insurgency. Fighting flared in seven neighborhoods of Ghazni, including three pockets within a half-mile of the governor’s residence, said Nasir Faqiri, a member of the provincial council. The most intense fighting, he said, was under way near a prison holding Taliban fighters on the southeastern edge of the city, 80 miles southeast of the capital Kabul. Nearly two days after Taliban fighters struck the city in a multipronged, nighttime attack that left many of its 143,000 residents cowering in fear, gloom was setting in, despite official assurances that the situation was under control. “Morale is sinking. There aren’t enough soldiers and police in the city right now to resist,” Mr. Faqiri said. Ambassador Tariq Ali Bakhiet is the Director General of Political Affairs for the Organization of Islamic Cooperation, the second-largest intergovernmental body in the world; he was previously a diplomat at the Sudanese Mission to the United Nations and at the Sudanese Ministry of Foreign Affairs. At last week’s NATO Summit, world leaders discussed the country in which the alliance has had its longest-running military operation: Afghanistan. In Brussels, the country was seen as a global security challenge; Britain announced it would double its troops there. But away from the cameras, 4,000 miles away, in Mecca, a town that unites Muslims across the world, something unprecedented was happening in Afghanistan’s four decades of near-constant war. One hundred religious scholars, or ulema, from across political parties, sects and ethnicities — from those hailing from the hinterlands often controlled by the Taliban to non-Pashtu minorities — met in a safe location to discuss one thing: peace. The deployment is part of Pitch Black, an annual multilateral joint exercise described by the Australian host as “pivotal to ensuring [the] air force remains ready to respond whenever the Australian government requires”. It will be followed by Mission Pegase in August, when a French Air Force contingent is to visit Indonesia, Malaysia, Singapore and India. 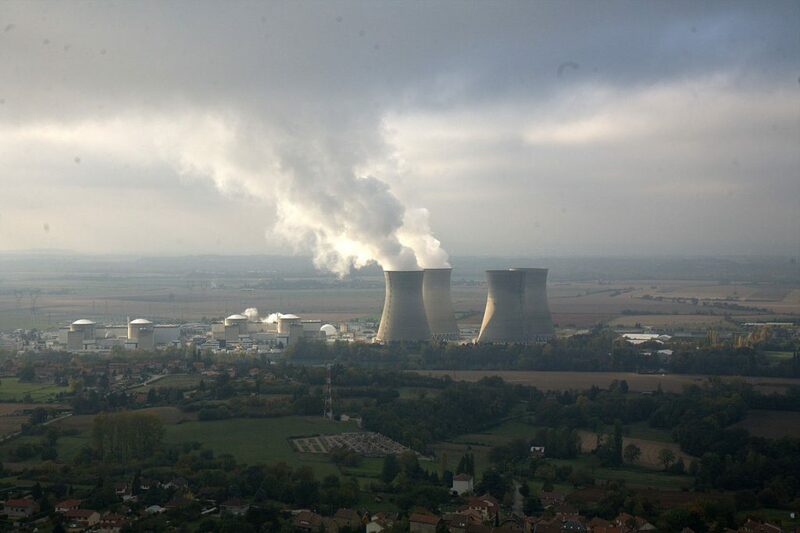 The French Ministry of Armed Forces describes that mission as helping to “deepen our relations with our main partner countries”, “maintain operational condition so that the air force can be deployed anywhere in the world and showcase France’s power projection capacities and defence aeronautics industry”. 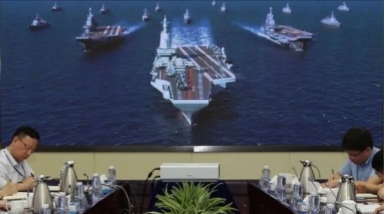 Much has been reported on the Chinese navy’s recent milestones in surface warship procurement, from the recent dual launch of two 055 destroyers, to advancements in the carrier program and the winding down of 054A frigate production. Production of Y-8Q/KQ-200 ASW patrol aircraft, 052D destroyers, 056 corvettes, and 071 amphibious assault ships have also continued. These projects were verified through “evidence” in the form of undeniable photos or video, often taken in early stages of construction, launch, or maiden flights. Furthermore, a crescendo of speculation for new People’s Liberation Army (PLA) projects often precede their photographic confirmation, and as of mid-2018 there are a number of projects that are likely to definitively emerge and become “confirmed” within the next few years. 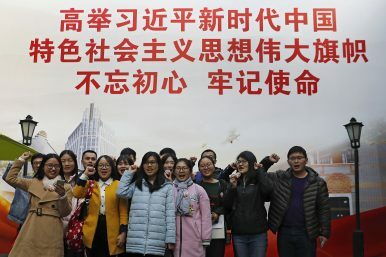 In this Nov. 19, 2017, photo, a group of university students raise their fists to take the oath in front of a giant propaganda billboard on display near the museum of the first National Congress of the Communist Party of China in Shanghai, China. The words on the billboard reads "Hold high Xi Jinping's new era and the great banner of socialism with Chinese characteristics, don't forget to remember the mission." Xi Jinping is one of the few Chinese leaders whose name appears alongside his own doctrine in China’s constitution. But supremacy in the legislative and political spheres is only the beginning of Xi’s influence. His government is poised to shape many areas of society. Giant billboards, once the domain of businesses vying for the attention of a spirited middle class, are now commonly found propagating Xi’s slogans. They are a ubiquitous symbol of the growing entrenchment of the state in Chinese daily life. As The Diplomat reported earlier, China has been reshuffling its propaganda and censorship chiefs recently. Multiple non-Chinese mainland media outlets, including the South China Morning Post, cited anonymous sources explaining that the top authority’s motive for the reshuffle is to “improve the country’s image abroad and ensure online views toe the Communist Party’s line.” Chen Daoyin, a political analyst in Shanghai, told the SCMP that China’s propaganda work, which “overhyped China’s rise,” is “a strategic mistake or failure.” “Someone has to be responsible [for this mistake], and changes needed to be made,” Chen added. 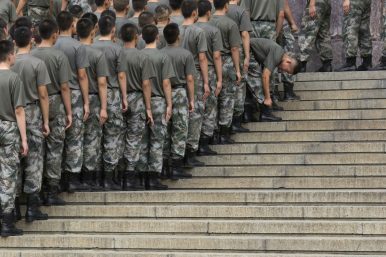 China’s military, the People’s Liberation Army (PLA), is aiming to improve the quality of its recruits in the 2018 conscription season (from August 1 to September 30). 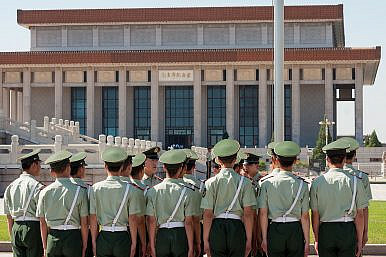 While conscription still technically exists under China’s Military Service Law, it has been rarely enforced by the authorities because China’s vast population produces more than enough volunteers for its military needs. On June 27, the annual National Conscription Work Video Conference was held. It set three priorities for this year’s conscription work. One priority is to increase recruits for the navy and the air force relative to the army. This is not surprising given that the PLA is currently in the process of rebalancing its force composition by downsizing its army and boosting its air, naval, and missile forces. To illustrate, since July last year, the PLA has cut around 300,000 troops, with the bulk coming from its ground forces. Since assuming power, Chinese President Xi Jinping has taken many steps to reshape his country, de-emphasizing growth to build a more sustainable economy and engaging in more proactive diplomacy. He has also been rewriting political rules to establish himself as a strongman. But as China's economy slows while the United States escalates its trade attacks, policy debates inside the country are intensifying and testing core pillars of Xi's economic and foreign policies — as well as his own political strength. Despite the challenges, China cannot afford to dial back its progress in economic development and global involvement, especially considering its growing strategic competition with the United States. It was about a year ago that I first walked into Karim's restaurant, intending to write about it as part of the food guide I was putting together about ethnic Uighur restaurants in the traditionally Chinese “inner China” of the country's east and south. Having already spent a decade researching the Uighurs – a largely Muslim ethnic minority group based mainly in the westernmost Xinjiang region, outside inner China – this food-guide project was intended as a fun spin-off from my usual linguistic studies. Or even a “treasure hunt”, you might say, given the rarity of Uighur restaurants in such major inner-China cities as Shanghai, Beijing and Guangzhou, where the Uighurs are migrants and where the Han Chinese, the dominant ethnic group that account for more than 90% of China's population, are the great majority. BEIRUT - As Syria’s war enters what could be its last and most dangerous stretch, the Syrian government and its allies will have to contend for the first time with the presence of foreign troops in the quest to bring the rest of the country back under President Bashar al-Assad’s control. The government’s recent defeat of rebels in the southwest of Syria has put Assad unassailably in control of a majority of the country, his hold on power now facing no discernible military or diplomatic threat. But at least a third of Syria remains outside government control, and those areas are occupied both by Turkish and American troops. Turkey has deployed soldiers in the northwest, in parts of the rebel-held province of Aleppo and in Idlib, which Assad has identified as the next target of an offensive. About 2,000 U.S. Special Operations forces hold sway in the northeast, in support of their Kurdish allies fighting the Islamic State. THE FUTURE OF STABILITY OPERATIONS: CAN THE U.S. DO BETTER? Over the past two decades, the U.S. has led or participated in an array of civilian and military efforts in unstable and conflict-ridden nations around the world, to rectify human rights abuses, restore peace, security, governance, and stability. The U.S. has been officially involved in Somalia, Haiti, Bosnia, Kosovo, East Timor, Afghanistan, and Iraq. [i] However, deeply rooted strategic and operational issues surround the U.S. approach to stabilization, which, if not addressed promptly, could undermine the sustained success of future stability operations. While there has already been a response to some of these issues in an inter-agency report released on June 19, 2018, the “Stabilization Assistance Review” (SAR), it has been met with some resistance in the National Defense Strategy (NDS). The new report may not be enough for the U.S. government to see a return of investment and success in future stability operations. WASHINGTON - In an era where talking about great power competition is all the rage, the U.K.’s top defense official has a stark warning: Western nations need to start thinking about the big picture. Speaking in Washington on Aug. 7, Gavin Williamson, the U.K. defense minister, warned that not enough is being done to plan for long-term efforts by Western nations to counter the potential threats from Russiaand China. “The debates about grand strategy among NATO partners, among the West, among our friends and allies, there’s not enough talk about it,” Williamson said during a visit to the Atlantic Council. “You want to be having that conversation because if we do not have that conversation, if we do not start planning for it, we will be ill-prepared for it. Department of Homeland Security Secretary Kirstjen Nielsen recently traveled from Washington D.C. to New York with her senior team in tow, to announce the creation of the National Risk Management Center. It is intended to be DHS’ tip of the spear when it comes to information sharing between the public and private sectors about emerging and sometimes urgent, cyber security threats. 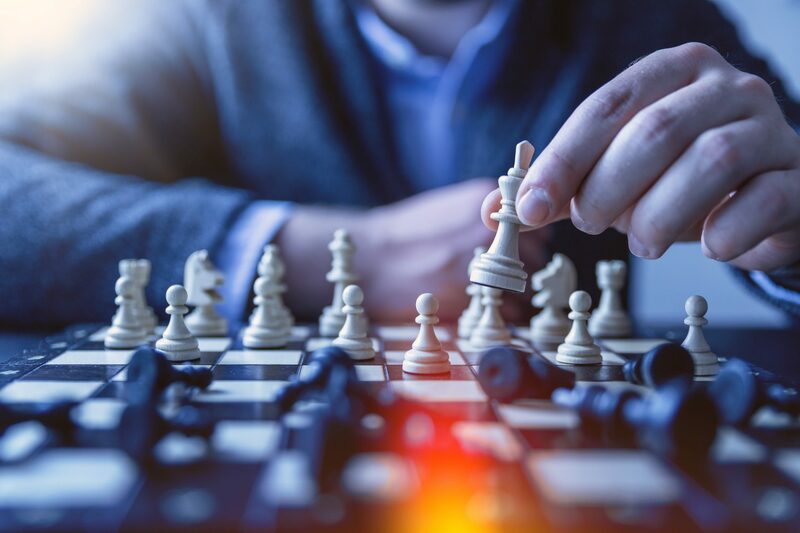 In an opinion piece posted on CNBC, Nielsen said that the U.S. is not “connecting the dots” quickly enough and said “Between government and the private sector, we have the data needed to disrupt, prevent and mitigate cyberattacks. But we aren’t sharing fast enough or collaborating deeply enough to keep cyberattacks from spreading or to prevent them in the first place.” As DHS takes on a new collective defense strategy by putting a premium on public-private information sharing efforts, The Cipher Brief wanted to know a little more about how DHS itself stores and accesses the vast amounts of data it holds. The pseudonymous ‘Steve B’ hits three nails squarely on their heads. In ‘A New Approach to Command Post Training,’ (Wavell Room, 10 July 2018) he provides us with a report on the current condition of battalion-level command post exercises in the British Army, a diagnosis of the malady that plagues such undertakings, and a promising prescription for a cure for that particular ailment. To be more specific, ‘Steve B’ describes ‘overly scripted’ events ‘with limited scope for free play or imagination from either side, argues that these fail ‘adequately simulate the mental and physical strain of combat’, and proposes that they be replaced with a smaller number of exercises in which complete brigades engage each other in full-scale, free-play field exercises. The Web is still a DARPA weapon. 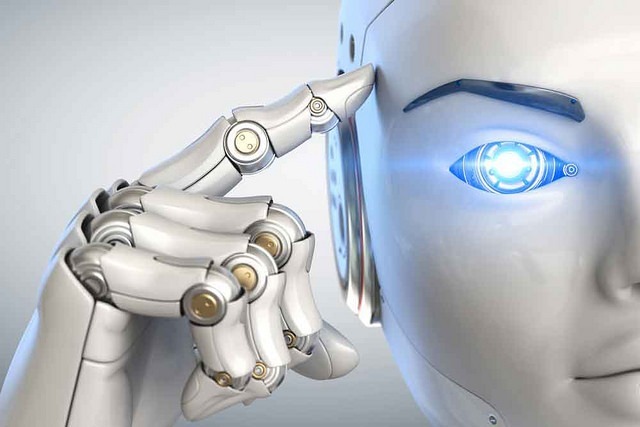 The goal was to exploit new computer technologies to meet the needs of military command and control against nuclear threats, achieve survivable control of US nuclear forces, and improve military tactical and management decision making. If you know the history of that period, with the ongoing Cold War, you know that the Internet has been a great geopolitical success, beyond any hope. The International Network became more than a medium, it is a message in itself, a message of friendship and cultural collaboration between Nations.A message against the internationalism of Communism that back then was fighting for the “abolition of the state”. All this might seem weird or even incredible to young programmers born after 1989, but back then, if you were not from USA or USSR, it was very hard to understand who was your enemy and who was your friend. Ben Wheatley is a Honorary Research Fellow in the School of History, University of East Anglia and a former Teaching Fellow at the Defence Studies Department, King’s College London. His 2017 book, British Intelligence and Hitler’s Empire in the Soviet Union, 1941-1945 published by Bloomsbury Academic will be available in paperback from August 2018. You can follow him on Twitter at @DrBenWheatley. Today we live in a networked world. Our reliance on the internet and social media has made open source intelligence (OSINT) a key resource for intelligence and security agencies across the world. However, the importance of OSINT is far from a modern development. The British government, for example, has placed the serious study of OSINT at the centre of its intelligence arsenal for the last 100 years (2018 being the centenary), but until now, to little fanfare. The Navy as a whole is poised to grow in coming years -- but top brass say there's still no room for senior officers who don't carry their weight. In a new move aimed at rooting out officers who are underperforming or causing problems at their units, the Navy on Thursday announced the creation of a new Selective Early Retirement Board, set to convene this fall. The move was made possible by a provision in the Fiscal 2018 National Defense Authorization Act that gives military service secretaries the ability to look within subsets of paygrades to find officers who aren't making the cut, Chief of Naval Personnel Vice Adm. Robert Burke told reporters this week.